Sherkin Island Marine Station has just published a book documenting the diverse plant life of the islands of Bantry Bay, Co. Cork. 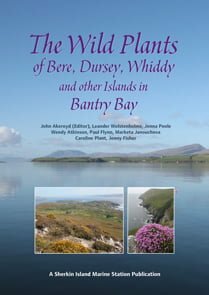 Edited by botanical consultant, conservationist and writer John Aykeroyd, “The Wild Plants of Bere, Dursey, Whiddy and other islands in Bantry Bay” explores the history, geography, geology vegetation and land use in this beautiful part of Ireland, and presents a comprehensive annotated catalogue of the wild plants found there. The book brings together and presents all of the data collected by botanists based at Sherkin Island Marine Station between 1997 and 2008, and offers a unique insight into the botanical composition of this unique corner of Ireland. We’ll be publishing a full review to the site in due course… meanwhile, if you’d like to take a look for yourself you can order the book direct from Sherkin Island Marine Station, pick up a copy at local and larger national bookshops or find it on Amazon and other online book retailers.